Mr Jump is a free game from the platform jumper family, in which it’s your job to get the character to the end of the stage without falling off any platforms or hitting into any sharp obstacles. The one means of control is tapping down, which causes the guy to jump. Holding the tap for longer corresponds to a longer jump. Simple. But yet so challenging. 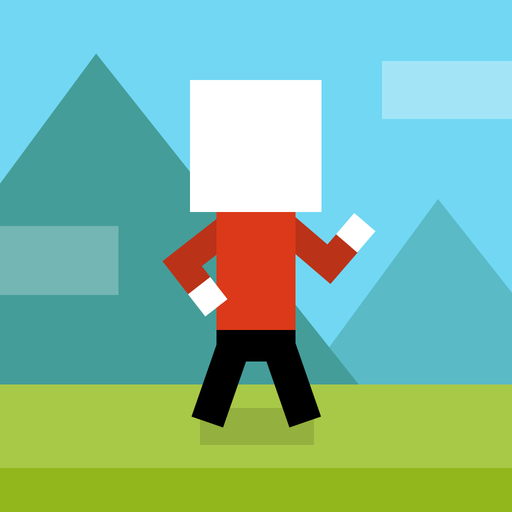 Mr Jump is a really difficult game that will take upwards of hundreds of tries to beat a single level. Now, I’m not complaining that it’s too hard, but after a while of being addictively forced to hit “retry,” the game loses its replay value. Yes, it’s one of those games that makes you cringe and scream every time you lose, but it’s just not the type of game that can maintain its great level of entertainment for more than a week or two. Especially if you’re stuck losing every single time at the same obstacle of the same level. There are some things here and there added in to spice up the game, such as blocks in midair that you can bound off of, or blocks that give unlimited midair-jumping ability, but even they fall short after playing the same levels over and over (and over) again. I’m not entirely sure of the more recent addition of a “World B” that is more or less the same thing just rebranded to make it seem like there are even more levels. But like I said, Mr Jump is a great platform jumper for at least a while, and perhaps you may be more enamored with the game after a long time of playing. 6/10, definitely some value there.